Sharon was determined to get some stain applied this weekend! She decided to do the side door as a "practice" warmup for the master bedroom and is really glad she did. The Jel'd stain has a texture somewhat like shaving cream and can make quite a mess onto adjacent surfaces. Much masking is definitely going to have to happen. After this door dries, Sharon will go ahead and apply a finish. Though we've been using shellac on most of the woodwork in the house, this is an exterior door, so we're going to use a finish that can tolerate some amount of moisture; probably a marine varnish. 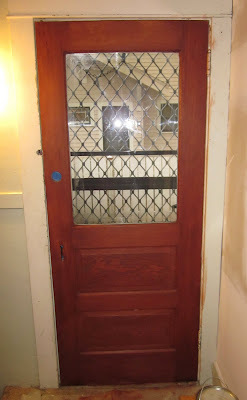 The woodwork around this door is very beat-up, so we are not going to strip and stain it. Instead, we're planning to replace it with new fir when we get through our huge task list and this project makes it on the queue. The huge list really is helping us be more productive lately. Once we finish or get tired of a project, we go peruse the list and see if there is anything else we feel like working on. Today, Jeff cleaned more gray bricks. Hopefully we're getting close to having enough for the front walk. Let us know what kind of finish you end up using on the exterior door--we're going to be staining our new front door in the next couple of weeks and haven't decided how to finish it yet.